Hans Lohninger et al. (November 2, 2005). 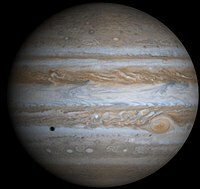 "Jupiter, As Seen By Voyager 1". A Trip into Space. Virtual Institute of Applied Science. Retrieved 2007-03-09. Seronik, G.; Ashford, A. R. "Chasing the Moons of Jupiter". Sky & Telescope. Retrieved 2007-03-09. Anonymous. "In Pictures: New views of Jupiter", BBC News, May 2, 2007. Retrieved on 2007-05-02.